The holidays are here! 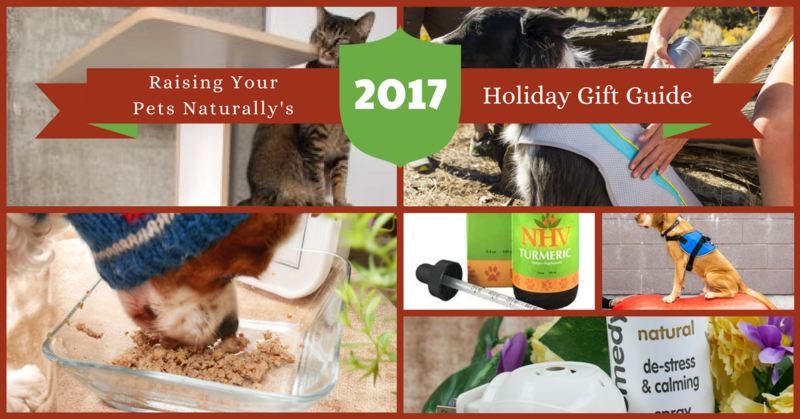 Welcome to Raising Your Pets Naturally’s second Holiday Gift Guide for The Natural Pet Lover. This holiday gift guide for 201 is unique – only the best companies, brands, and products make the guide. If you are looking for unique Christmas gifts for dogs or fun Christmas gifts for cats, this pet gift guide is for you. But it’s not just about our pets! You will find some of the best natural, healthy, and fun products for people too. I do hope you enjoy this unique gift guide. Pet Double Slow feeder&Stainless Steel Water Bowl (400ML) Fun Feeder Bloat Stop, Eco-friendly Slow Feed Dog Bowl is made with high-quality, food-safe ABS plastic, enjoy a funny and healthy meal. Order Today! Doggy Do Good Premium Pet Waste Bags are the future of dog poop bags because they are biodegradable & compostable. Vegetable based – made from corn starch (an annually renewable resource) and other bio based proprietary components, our bags are a great alternative to regular polyethylene plastic bags and are safe for the environment. Order Today! 100% Wool Felt Cat Ball Toy- All Natural- Safe, Eco-Friendly. ALL NATURAL- These toys are made from organic, eco-friendly wool, without any harsh dyes. 100% WOOL CAT TOYS- Safe for all your little furry friends! 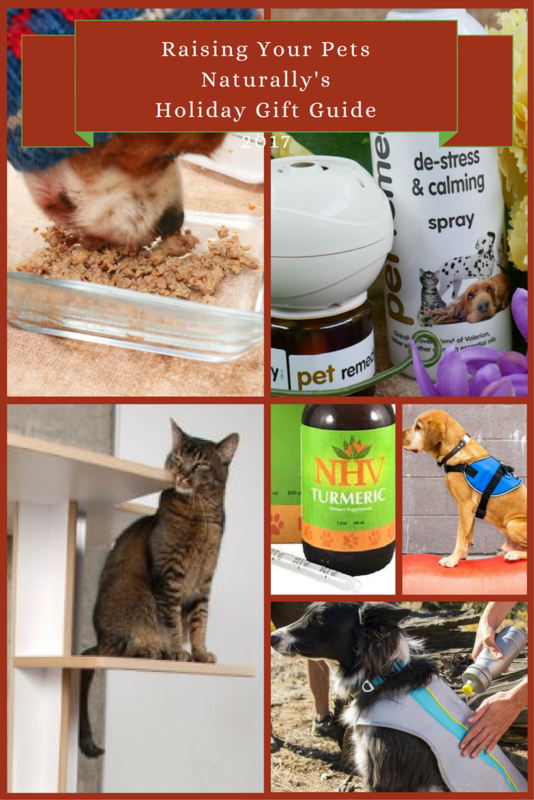 Safe for Small Dogs, Ferrets, Kittens, Cats, Kitties, and Birds Order Today! ecoFlex Pet Crate/End Table. The ecoFLEX Habitat ‘n Home InnPlace Pet Crate with Metal Spindles is the perfect crate for your pet while they are indoors. This stylish crate can pull double duty as an end table too. Made of durable non-toxic materials that is maintenance free as it will not crack, warp, absorb moisture and is easy to clean. Available in Russet, Espresso and Antique White. This easy to assemble crate is available in four sizes to accommodate all dog sizes. Double latches on large and XL models. Order Today! ORE Pet Recycled Rubber Pet Placemat Mini Bone. Let Your Dog Enjoy Its Playtime ORE Pet Recycled Rubber Pet Placemat Mini Bone is a special product for your dog. It is all natural. It also shields your floor from getting messy. ORE Pet Recycled Rubber Pet Placemat Mini Bone Made in USA Made from recycled materials and is 100% ecofriendly Can be wiped clean Measures 12 x 18 inch ORE Pet Recycled Rubber Pet Placemat Mini Bone is a unique placemat that serves as an eating place and a playground both for your pet. Order Today! GIVE YOUR CAT THE GIFT OF PREMIUM COMFORT with a Merino wool Cat Cave from Meowfia! Each cat cave is carefully handcrafted from 100% all-natural wool by artisans in Nepal. Using an ancient fabrication technique called felting, every cat bed is individually molded using only soap, water, and pressure. Eco-Friendly 100% Merino Wool Cat Bed – Soft and Comfy Beds – Piece of Art – Knitting Order Today! Baobab Modern Cat Tree in Eco-Friendly White Laminate and Black Mohair (Faux). Baobab is a very large tree native to Africa and Australia. Our Baobab is much smaller, but is sure to become your cat’s new home within your home. Laminate with 100% recycled wood fiber. The 4 branches are designed for climbing and playing, while the 5′ treetop is a perfect place to rest, observe, or scratch. Catnip can be placed behind or rubbed onto the inserts to further entice scratching and playing. Order Today! Pet Lounge Studios Bambu Hammock II The Bambú Hammock’s combination of clean lines, unique sleeping surface and rich ecofriendly materials make it our most sought after design. The unique sleeping surface responds to your pet’s body weight which helps relieve many of the pressure points that create discomfort and often lead to arthritis. The Hammock is designed with a solid bamboo frame and a removable/reversible ultra-suede cushion which is inherently stain resistant and hypoallergenic. Order Today! Help save the planet with our Scrappy Pets Eco-Friendly Dog Collars. Scrappy Pets dog collars are the perfect designer accessory for your pet. Made from beautiful premium scrap leather that would otherwise end up in our landfills. These Collars are cool, comfortable and extremely durable. Matching harnesses and leads can be worn as a great accessory along with your new scrappy pets collar too! This is an ideal dog collar for hanging I.D. tags, nighttime safety devices, and charms. Order Today! 4-Legger – Give Your Dog A Healthy Bath with 4-Legger! Our co-founder’s own battle with cancer began the day she lost her beloved dog to the same disease. We created 4-Legger USDA Certified Organic Dog Shampoo with all natural ingredients you can trust (and pronounce). Our mission is to reduce exposure to unregulated cancer-causing chemicals in the pet grooming industry. Clean ingredients. Clean pets. It’s that simple. Raisenaturally20 for 20% OFF Order today! SALBAKOS Luxury Spa 100% Combed Turkish Cotton Large Oversized Eco-Friendly Bath Sheet. Towels made in Turkey are softer and more durable because it is the only country which does not use any bleach in the manufacturing process, including white towels. Order Today! BBEART Pet Clothes, Fashion Dog Quick Drying Bathrobe Powerful Absorption Bath Towels Cat Royalblue Washcloth Coat. SUPER ABSORBENT and QUICK DRYING – Meaning it holds substantially more water than larger and bulkier Cotton Robes, and air dries super quick. 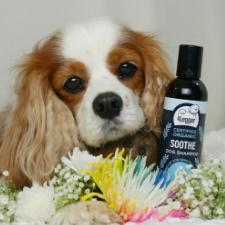 Fantastic When Used with a Microfibre Dog Towel. Order Today! Wahl Professional Animal KM10 2 Speed Brushless Motor Clipper Kit. Precision cuts are a breeze with the advanced brushless motor of the KM10 ensuring quality grooms and optimal results while maintaining lower levels of heat and vibrations than other professional rotary clippers. Order Today! Natural Breath Drops for Pets with Chlorophyll & Peppermint Essential Oil. Sweet Breath is a simple solution to decrease odor & enhance your dog’s oral & body health. Unlike watered down chlorophyll sold in health food stores, the form of chlorophyll in Sweet Breath is a juice powder concentrate. While more costly to produce, its efficacy is quite difficult to match. Order Today! Icelandic+ Cod Fish Chips Dog Treat. With our Cod Fish Chips, you can treat your dog to a crunchy, all-natural snack that features just one ingredient—pure Icelandic cod (no additives, no preservatives and no supplements). They’re line-caught daily in the icy-cold waters of Iceland and are processed immediately for freshness you can count on without a heavy fishy smell. Order Today! Beef Bark – As Natural As It Gets – 1 Ingredient!!! 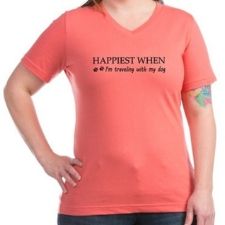 Sourced and Made USA, Portion Of All Proceeds Donated To Dogs In Need. Thinly Sliced For Dogs Of All Size And Age. 100% Sourced And Made In The USA Order Today! Orijen Acana Mackerel and Greens Freeze-Dried Dog Treats. Wild-caught from cold New England waters and bursting with flavour and healthy omega-3 fatty acids, our Atlantic mackerel arrives fresh and whole at our DogStar kitchens. Order Today! Beef Lung Treats for Dogs by CountryPet Naturals – Air Dried, Healthy Snack and Training Reward – 100% Natural, Grain Free, Gluten Free, Single Ingredient – Made in New Zealand – All of our animals are pasture-raised on farms in New Zealand, resulting in dog treats that are free of antibiotics, hormones and other drugs. Order Today! 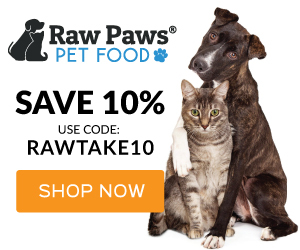 Raw Paws Pet Premium 6-inch Beef Jerky Dog Treats – Esophagus Dog Treats – Beef Jerky for Dogs – Naturally High Glucosamine & Chondroitin Dog Treats – Grain-Free, No Antibiotics or Hormones. MADE IN USA: Our beef jerky treats are always sourced from USA family farms. Order Today! Ultra Paws Basic Skijor Package. Skijoring is the exciting sport of being pulled on skis by one or more dogs in harness. Order Today! RUFFWEAR DOG COOLING VEST. The Ruffwear Swamp Cooler uses natural evaporative cooling to keep your dog cool. Soak it in cold water, wring it out, and fasten around your dog. Evaporative cooling exchanges the dog’s heat as water evaporates from the coat’s reservoir. Temperatures drop through the phase transition of liquid water to water vapor, mimicking the cooling effect of humans’ sweat. Order Today! Nosework Training Scent Kits. The entire Nosework Sport Training Scent Kit is contained inside of a small waterproof, impact-resistant, hard plastic case that makes safely transporting all your Nosework training aids convenient and simple. Order Today! FitPAWS Peanut Canine Stability Ball. The unique, elongated peanut design provides a dog-specific training platform that promotes better form and a more stable training platform. The versatile Peanut shape targets front-to-back or side-to-side movements, important to dogs new to core conditioning training. Order Today! Mini Travel Teeter (Dog Agility See-saw). An amazing feature of this teeter is that it quickly breaks down into 3 pieces without any tools and fits right into the back of a car! Made of sturdy plastic boards that are weather proof and maintenance free, these boards will not warp or rot. Order Today! Pod 3 is a small tracking device using multiple technologies to help you find and protect the things that matter most, anywhere in the world with cell reception. 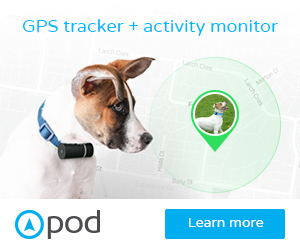 GPS, Wi-Fi, Bluetooth and cellular technologies work together to allow you to find and protect your pet at the push of a button, giving you the peace of mind you’ve always needed. 5% OFF Storewide SAS517 Ends Soon. Order Today! Gunner Kennels. Gunner Kennels® is the first and only pet travel product to receive a dual 5 Star Crash Test rating from the Center For Pet Safety. Engineered with the same processes and high-quality materials as the G1™ series, the Small was designed for the invested dog owner who puts safety first. Order Today! Dog Diapers Wraps for Male Dogs Reusable Washable Eco-Friendly Belly Bands – 3 Pack Soft Breathable Mesh Secure Velcro. ECO-FRIENDLY –Washable dog diapers are completely washing machine safe, cleaning our dog diapers is quick and easy. Recycle, renew, reuse male dog diapers. When there done just tumble or air dry. Order Today! Ruffwear – Highlands Sleeping Bag for Dogs. The Highlands Sleeping Bag features a side zipper that opens the bag wide for easy entry and zips closed to retain body heat. The integrated pad sleeve can accommodate the Highlands Pad (sold separately) to offer your dog the best possible sleeping experience while traveling. Order Today! Through a Dog’s Ear Driving Edition. 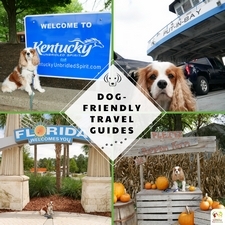 Many dogs love to go for a ride but traveling in the car can also be extremely stressful. Through a Dog’s Ear: Driving Edition offers a drug-free solution with psychoacoustically designed music that strikes the ideal balance of keeping you alert in the driver’s seat while soothing your dog’s nerves for a comfortable, pleasant journey. Order Today! Addalock~The Addaock is a portable door lock that installs in seconds without any tools required.Use it on the front door of your home and take one with you when you travel. Order Today! 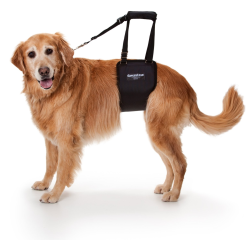 Meet your bow-wow factor, this adorable piece combines style, color, durability and lightweight ease to every trip you take. Strong polycarbonate, large main compartments, full-featured interiors and spinner wheel designs put this collection at the top of your packing list. Order Today! Kitchenhoney Travel Coffee Tumbler Cup with Lid Wheat Straw Eco-friendly Water Bottle. Made of biodegradable wheat straw and non-toxic material, environment-friendly and healthy.Double layer insulation, heat resistant,offer 20 to 30 minutes heat retention for your tea of coffee. Heat-resisting: -20℃~100℃. Order Today! Florious Eco-Friendly Travel Passport Holder With RFID. FINALLY! AN RFID NECK WALLET FOR YOU AND THE PLANET. Our wallet is the ONLY one made from recycled materials, saving thousands of pop bottles from the landfill. Order Today! AMIR Bamboo Charging Station. Eco-friendly Material & Compact Design – The station is made of natural bamboo wood. The surface of stand is sleek and it is a great place to keep your iWatch clean and safe during charging with the elegant and compact design. Order Today! 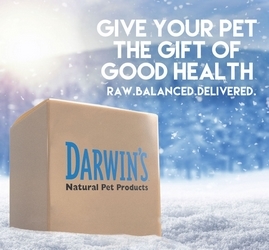 Darwin’s Natural Pet Products Raw Food Give your dog or cat the gift of good health with nutritionally balanced raw food made with the highest-quality ingredients. Pets love the taste, and the meals contain no grains, hormones, steroids, or antibiotics, or fillers. Your custom order ships right to your door—just thaw and serve! Order today. 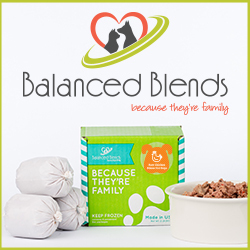 Balanced Blends Raw Pet Food Veterinarian and nutritionist-designed dog & cat food delivered right to your home, then just thaw and serve. Their Balanced Raw goes beyond just a balanced recipe. Better nutrition needs to start with fresh, human grade proteins, and organic fruits & vegetables (for dogs only), that are prepared to be balanced, safe, and conveniently delivered to your home. Order today! Click Link for $2 OFF & Free Shipping on your Starter Pack! As we always say at Raw Paws – the best chance of having a happy pet is through the best quality nutrition. We only source from responsible and ethical farms so we can deliver the highest quality products made with the freshest ingredients! Our service promise is to make sure that you and your pets are truly satisfied. Order Today! 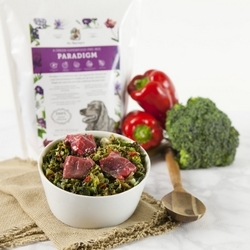 Dr. Harvey’s Paradigm is a specially-blended “green food” pre-mix which makes an ideal base for a nutritionally complete low-carb diet. Holistic vets agree that a low-carb, low-glycemic diet can help dogs prevent, manage and overcome serious health problems such as obesity, immune system weakness, diabetes and cancer. Order Today. Java Planet – Coffee Beans, Organic Coffee Sample Pack in Burlap Bag. Smooth, full flavored coffee without the bitterness or burnt taste. Absence of pesticides and chemicals (organic coffee) improves flavor. Order Today! Four Sigmatic Organic Mushroom Hot Cacao with Reishi to Relieve Stress, Vegan, Paleo. Promotes the hormonal system, adrenal glands and provides balanced, long-term energy.Dark and spicy taste makes for a perfect after-meal or dessert drink and helps you get rid of sweet cravings.Vegan, vegetarian, & paleo friendly – contains tree nuts – coconut Order Today! Taza Chocolate Mexicano Disc, Stone Ground Organic, Sampler.Try every flavor of Taza’s Chocolate Mexicano discs! This colorful gift is a fun, affordable way to sample and share stone ground chocolate with true grit. Eight bright, bold flavors range from spicy to sweet to savory. Contains 8 x 1.35 oz Chocolate Mexicano Discs: Cacao Puro, Chipotle Chili, Cinnamon, Coffee, Guajillo Chili, 85% Super Dark, Salted Almond, and Vanilla. Order Today! Chateau Rouge – Prince of Earl Grey, Organic Loose Leaf Black Tea. A quintessential English afternoon tea that is fragrant, smooth and light. Our special blend is created from selected single estate handpicked large leaf Keemun, Darjeeling and Ceylon teas. This luxurious classic is delicately flavoured with Calabrian bergamot oil, wild meadow flowers and Madagascan vanilla pods. Order Today! Organic Popcornopolis Gourmet Popcorn – 4 Cones – White Cheddar, Zebra, Caramel & Kettle – Small Storage Space Friendly & Great Stocking Stuffers!If you don’t have room for a huge bag of popcorn, try this delicious 4 pack. Flavors include: White Cheddar, Zebra, Caramel and Kettle. Everyone Loves Popcorn! Order Today! Canna-Pet’s cannabinoid (CBD) nutrition is made with Industrial Hemp. 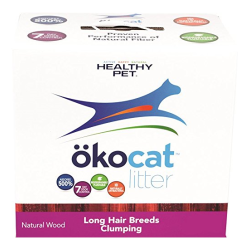 An organic, whole-plant product, developed from the ground-up specifically for pets. 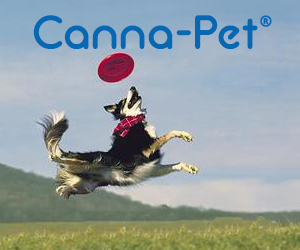 What do customers use Canna-Pet for? Anxiety, Arthritis, Allergies, Cancer, Digestive Issues, Seizures, Inflammation, Joint & Mobility Issues, Pain, Homeostasis And more! 20% off Your first order code: new_customer20 Order Today! There are many reasons why pets can be stressed out and as we all know, pets do not do well with change. All pets do not show the same signs when it comes to stress and therefore they can be easy to overlook. Excessive grooming is one of the most common signs, however loss of appetite, less interaction with family members, hiding, change in relationship with companion pets and aggression are other warning signs to look for. Often, it’s important to have a solution that will reduce stress and calm our kitties. 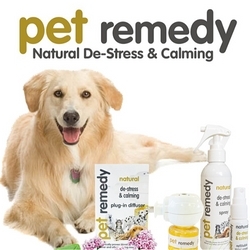 Pet Remedy is such a solution. Order Today. Botanical Animal Flower Essences. Helps to alleviate hysterical behavior or extreme terror arising out of feelings of abandonment and isolation when left home alone. Pulls them out of the panic that may be causing bodily harm. Other formulas available. Order Today! Portable speaker + 5 hrs of clinically-tested calming music by “Through a Dog’s Ear” | iCalmDog. 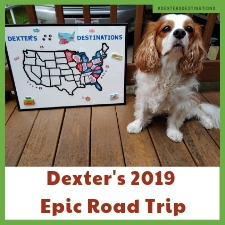 This deluxe package includes a customized bluetooth music player with 5-hrs (on two separate micro SD sound cards) of soothing piano music that’s clinically-proven to relieve canine anxiety and enhance the bond with your trusty pal. Order Today! Nature Gnaws Large Bully Sticks – 100% All Natural Grass-Fed Free-Range Premium Beef Dog Chews. Nature Gnaws was founded on the idea that our pets deserve the best, and that we are allowed to be just as choosy with what our pets put into their bodies as we are with what we put into ours. Order Today! The Healthy Companion Company | A HEALTHY, NATURAL CHOICE: Our Complete Meal Treats are made without chemicals, hormones, preservative, or other additives. They are also naturally grain-free. Since our treats are so fresh and untreated, we advise that you keep them in the refrigerator! We proudly make our treats in the United States from meat that is sourced exclusively from local farmers in the US. Order Today! Hare Today~Dehydrated Rabbit Feet Natural Dog Treat. 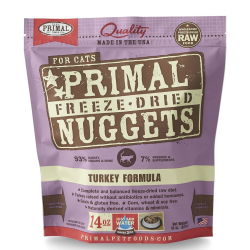 Dogs and cats LOVE these treats! These treats are especially nice for cats and the miniature and small varieties of dogs. If you’re wanting to introduce truly natural food, fur and all, to your pet, this would be a great way to start. Also great training rewards. Order Today! PetKind Tripe Treats “Green Beef Tripe” features only 1 ingredient: GREEN BEEF TRIPE. This “SMELLY” dehydrated treat is just what dogs love – EXTREMELY palatable and 100% PURE GREEN TRIPE! Order Today! Personalized Pet Photo Pillow, Custom Christmas Gift, Pet Memorial, Pet Loss. Purchase a Custom Pet Photo Pillow to make the toughest long-distance relationship a bit easier. How comforting to snuggle up to a pillow that looks like your BFF! Great for children, college students, and adults that are wild about their pets or missing one that has passed. Order Today! Receive all the benefits of Amazon Prime including FREE Two-Day Shipping for eligible purchases, unlimited streaming of movies and TV shows with Prime Video, and the ability to borrow books from the Kindle Owners’ Lending Library. Order Today! Cavalier King Charles Spaniel Angel Jewelry Sterling Silver. Our Cavalier King Charles Spaniel Angel Pendant jewelry is hand cast, when you place your order, using the lost wax casting process and is hand finished. This pendant may be ordered with optional engraving on the smoothly polished bone for a special personal touch. Hand cast in .925 sterling silver. Order Today! Other Breeds Available. King Charles Cavalier Treat Jar. Personalized at no Charge. Signed by Artist, Debby Carman. Ceramic, Dishwasher Safe, lead-free, food safe and microwavable, Ceramic Treat Jar Order Today! Other Breeds and designs available. Max Comfort Memory Foam Orthopedic Dog Bed Sofa. This simulated leather is extra thick for durability and very soft. It has a short finish of microfiber for added softness. These ultra comfortable dog sofa beds provide the maximum level of comfort for your dog. Available in sizes tiny to extra extra large for any size pet and dozens of fabric selections. Custom handmade to order for you and your pet in the USA. Order Today! For the Love of a Dog: Understanding Emotion in You and Your Best Friend by Patricia McConnell PHD As behaviorist and zoologist Dr. Patricia McConnell tells us in this remarkable new book about emotions in dogs and in people, more and more scientists accept the premise that dogs have rich emotional lives, exhibiting a wide range of feelings including fear, anger, surprise, sadness, and love. Order Today! Getting in TTouch with Your Dog: A Gentle Approach to Influencing Behavior, Health, and Performance by Linda Tellington-Jones. Linda Tellington-Jones is an internationally acclaimed authority on animal behavior and training and is the author of numerous books, including “Getting in TTouch with Your Cat,” “Getting in TTouch with Your Horse,” ” “and “Getting in TTouch with Your Puppy.” She lives in Kona, Hawaii. Order Today! 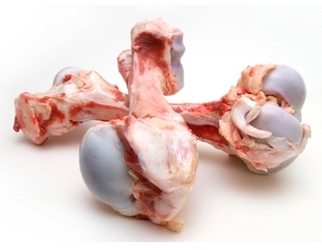 Unlocking the Canine Ancestral Diet: Healthier Dog Food the ABC Way by Steve Brown. Steve Brown, an expert on canine nutrition, shows how you can bring the benefits of the canine ancestral diet to your dog by feeding him differently as little as just one day a week. Order Today! Holistic Aromatherapy for Animals: A Comprehensive Guide to the Use of Essential Oils & Hydrosols with Animals by Kristen Leigh Bell. Aromatherapy was the first natural, holistic therapy the author began using, and she relies on it as my primary form of healthcare to treat and balance all sorts of minor ailments and discomforts in the lives of her family and their pets. Order Today! Dr. Khalsa’s Natural Dog: Holistic Therapies, Nutrition, and Recipes for Healthier Dogs. Developed over decades of practice and study, Dr. Khalsa’s methods combine traditional veterinary medicine, wholesome nutrition, and holistic therapies, such as alternative methods, herbal remedies, and botanical medicine. Order Today! Healthy PAWsibilities for Your Older Cat by Cathy Alinovi. If you have an older cat and are looking for practical ways to keep him healthier, longer… with less pain, more joy — and while spending a lot less money at the vet’s office — you’ve found the right book. Order Today! Muffin’s Halo Guide for Blind Dogs. Muffin’s Halo Blue Angel Wings ® is a 3 piece must-have device that helps blind dogs transition to becoming familiar with existing or new surroundings quickly. Order Today! 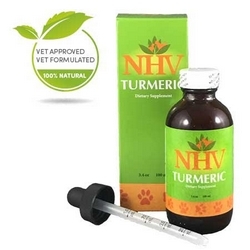 NHV Turmeric has been vet-formulated to help dogs and cats. Being liquid, it is easy to administer with food. It helps reduce inflammation of the joints, promotes healthy cardiac function and is also anti-cancer. It’s a super herb that can help enhance your senior pet’s quality of life, naturally! Order Today! 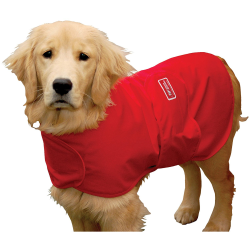 Back on Track Therapeutic Dog Mesh Coat/Blanket/Rug. Every dog can benefit from the natural warmth therapy this blanket provides. Made of a breathable mesh material, the inside is lined with state-of-the-art Welltex fabric containing ceramic powder. The ceramic reflects your dog’s natural body warmth and creates a soothing far infrared thermal warmth. Order Today! Are there any items you and your pet would enjoy? Tell me in the comments. We totally preach the idea of a slow feeder. If you just leave the food out, they’ll eat it all and gain too much weight! This is a very extensive list of products! I love seeing a nosework scent kit included! I do not have pets but have to say I love this gift guide. Will be sharing it with my family that has pets. Thanks, Anita. A few travel items too. I do appreciate the share. 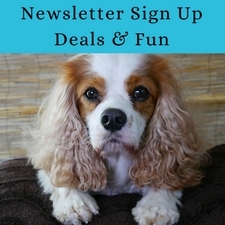 Such an awesome pet gift guide! I will totally get something from this for my dad! Who knew there were so many healthy products to choose from? Thanks for sharing. Wow this is such a comprehensive list of products! So many to choose from. That Mini Travel Teeter looks like so much fun. Thanks, Joline. I’ve had my eye on that teeter! All five of my animals would like some treats for Christmas. One of my dogs also wants some new balls for me to throw for him. How fun. Treats and toys are always a good bet. What great ideas for your pet!! Hi! Have you tried CBD oil with any of your pets? I am curious to read about the results. I tried it on a human (myself) and the results were “meh”. Thanks! Hi, Laurie. Yes, I have and do. It’s important to remember CBD oil isn’t the right addition to every alignment and they are not created the same. Here are 2 posts pertaining to my experiences. https://raisingyourpetsnaturally.com/cbd-oil-treatibles/ and https://raisingyourpetsnaturally.com/cbd-oil-for-dogs-with-pain/ I hope that helps. I don’t have any pets but I think this list is so cool! I almost want to get a dog so I can use it! hahaha Luckily, you can enjoy the inn without dogs too. Thanks, Rachel. Glad to help. 🙂 My puppy book (not just puppy) would be helpful too and I have a lot of articles on the blog. What a list! Pinning this for all the coming up birthdays! We also raise our cat on the slow feeding diet and ensure that they have plenty of exercise on their cat tree as well!